In the last decade or so, there’s been a steady upturn in the ability of the car stereo to do interesting things. It began with additions like satellite radio, which allowed you to get far more channels (and far more interesting content, due to being able to break away from FCC regulations) then you could possibly get on the regular AM and FM bands. Then came SiriusXM, which was just another name in the satellite radio game. But times moved on, and we got to the point where our cars began to become standard with huge touch screens that were designed to do everything from providing GPS directions and local food to play a DVD to keep your kids amused in the back seats. Even if your car doesn’t come standard with a touch screen car stereo, though, you can still install one in your car, in most cases. Now, depending on the age of your car, it may not be possible to get everything (for example, some older cars can’t take advantage of things like satellite radio), but the fact is that even without being able to stream satellite radio, you’re still going to be getting a lot more functionality out of your new touch screen car stereo than you would be out of your standard car stereo, in most cases. So, if you’re searching for the best touch screen car stereo, what can you do to find it? Well, stereos are complex pieces of equipment, and figuring out the best one for you is not something that is going to be done in a few seconds. I would make the argument, also, that there is no outright ‘best’ stereo, but rather a stereo out there that may be the best for you and the things that you are looking to do. To help you to better figure out which touch screen car stereo you might be happiest with, let’s begin with a handy little chart that shows the best touch screen car stereos of 2018, as seen below. 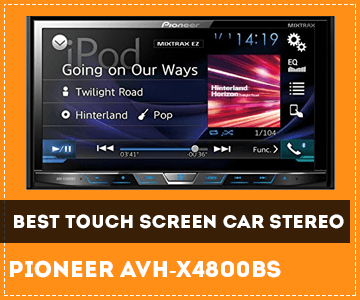 Now, let us take a deeper look at the various touch screen car stereos that we reviewed. The first touch screen car stereo that took a look at was from Pioneer. And let’s be honest here; Pioneer is a company that has spent a lot of time making sure that people could enjoy audio and video. Pioneer was a business begun in Japan in the late 30’s, when it was a radio and speaker repair shop. From those humble beginnings, it has become a worldwide business that is known for making everything from car stereo systems to home stereos systems and even Blu-Ray and DVD players. It only makes sense that a company with so long a history would be well represented in the reviewed products, therefore. Pioneer’s first offering is a lovely 6.2-inch touch screen that has a lot of functionality (which, really, is something that can be said for the majority of products that Pioneer has ever put out, to be frank). It comes with a DVD player, of course, and that DVD player is also capable of playing CDs if you so desire. Of course, why you would want to play CDs when you can run your mobile devices to the AVH-280BT is beyond me. All you need to do is to connect to them via Bluetooth, and you are good to go, streaming music directly from your favorite device to your radio. Thankfully, if you do decide to use CD’s or homemade DVDs of films and the like, the Pioneer AVH-280BT is capable of working with and reading a whole host of file types. It can work with MP1s all the way through MP4s, for starters, as well as WAV, ACC, AVI, and WMA types, which basically covers the majority of files that you would ever try to play through a DVD player. This means that even if you are one of those people who pirate their movies and their music (both of which are morally reprehensible and usually illegal, depending on where you live), or even if you’re one of those people who like to burn your own CDs from music that you own legally, you will not be likely to have to worry about compatibility. All told, the Pioneer AVH-280BT may still be the best touch screen car stereo 2017 has to offer. No need to tinker with a working design. ATOTO is not a name that has a history behind it (unlike the big name competitor that we just took a look at), but this does not mean that they cannot make a nice product that a lot of people will be happy to use in their car. To begin with, the ATOTO product is 7 inches wide (for the record, most screens, whether we’re talking about televisions, computers, laptops, or even cell phones, are measured corner to corner, in order to come up with that number and make them sound a bit bigger), which is a decent amount bigger than most of their competition. To the chagrin and shock of many, though, they do not have a disc player of any sort. This may seem odd to many, but this is an Android-based touchscreen stereo, and that means that it is mostly running off applications. To add to that, the ATOTO product has a Bluetooth connection. What this means is that not only will you be able to use plenty of really awesome applications to view various content, but even better, you will be able to utilize almost any file type that you could possibly encounter, so long as you download the right app. Some may feel a little weird about not only buying a touch screen car stereo without a DVD/CD player, but also about the fact that they’re basically using a tablet to control their car stereo. 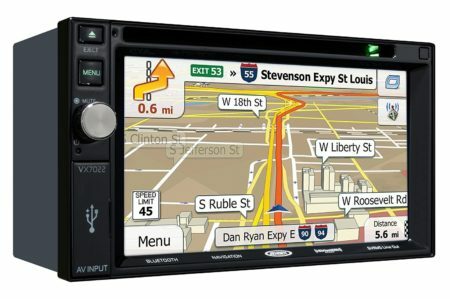 They need not worry, and they need to realize that not only does the ATOTO M4/M4171 offer all the things that the standard touch screen car stereos can offer, but it will also offer things like easy customizability and even easy utilization of a rear-view camera, if that’s something that you are interested in. This is easily the best touch screen car stereo with navigation, and honestly, it may well be the best touch screen car stereo for Android OS’s. If you’re looking to be pleasantly surprised, it may be a stereo that you would be happy to look into. 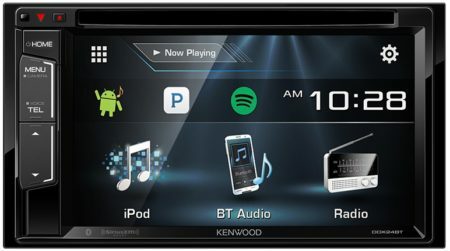 Kenwood is a name that has also been involved in the audio and visual games for quite some time. And that being the case, it is a product that you can feel free to purchase without a lot of fear that you may be getting ripped off or that you will end up with a lemon and not be able to return it with a working model. With a 6.9 inch screen, this is a real winner of a screen. Especially desirable is how the buttons are all at the bottom and are all extremely small, meaning that not only do you not have a lot of buttons cluttering up the screen area, but that you will be able to use the screen without worrying that you’re going to be accidentally hitting the wrong button on the side there. The DVD player is a decent one, and the Kenwood DDX773BH has a decent list of file types that it supports. It will work with Divx, MKV, and even AVI, which basically covers the vast majority of file types that you will commonly encounter on DVDs that you may want to watch. It also has Bluetooth connectivity, meaning that you can easily make use of hands-free calling and even stream various applications, like Pandora, from your smartphone, if that’s something that you’re interested in. Just be sure that you understand that when you’re doing something like that, you are likely to be cutting into your own pocket, because many of us do not get to enjoy the benefits of a world where everyone has free data plans. All things considered, this is a great touch screen car stereo, and it may even be the best touch screen car stereo for the money, especially if you’re looking to avoid buying a Pioneer model for some reason. I know that some of you are looking at this model and comparing it to the last Pioneer model that was reviewed and asking yourself what the difference is. And don’t worry; you have every right to do so, as they look almost completely the same! All I can tell you is that, when you’re a business as old as Pioneer is in this market, you understand, likely better than anyone, that no one should mess with a working design, and the Pioneer design for these touch screen stereos is one that works well. But wait makes this model stand out? 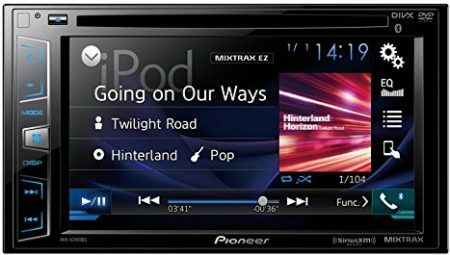 To begin with, this Pioneer model, the AVH-X2800BS, though it may be the same size as the 280BT, with the same screen and even the same general design, is able to do something that the 280BT cannot. Namely, it can interface with SiriusXM. Now, for many, that is not a big deal. SiriusXM is not all that popular these days, compared to how popular standard radio is. But that being said, there are plenty of people out there who want to be able to utilize SiriusXM, and this radio will allow you to do that. Honestly, other than that difference, there is not a whole lot of difference between this model and the AVH-280BT. Both have Bluetooth functionality, both allow you to take hands-free calls, and both, for some unknown reason, insist that the button for being able to pick up the call should be on the far side of the console. Makes no sense whatsoever. Anyway, if you’re looking for the top ten touch screen car stereos, this is definitely going to be pretty far up on that list. It is also definitely the best touch screen car stereo under 200 dollars. No, I did not accidentally include the same touch screen car stereo again. Thankfully, I do know something of what I’m doing. But I don’t blame you for thinking otherwise, seeing as Pioneer seems to have some weird love for using the same song in all of their images. Weird, right? Anyway, this is another offering from the fine folks at Pioneer. It is about the same, functionally speaking, as the last one that we took a look at, but in this case, it is capable of doing a few things that you cannot get from that model. Namely, it has a much bigger screen, clocking in at 7 inches wide, which is about as big as the touch screen car stereo screens get. That may not seem like it makes much difference, but when you’re trying to watch the new Avengers movie on there, you’ll understand how big of a deal it really is. The only other real big difference is that the faceplate is motorized. This means that when you are looking to change out your DVD or CD, you need only push the button and the faceplate will reveal your disc player (and your disc). 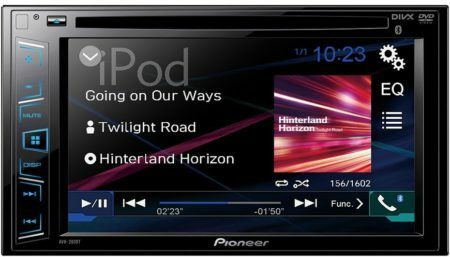 If you’re looking for an advanced model of the Pioneer AVH series, then this is definitely the one that you should be spending your money on, and you will not regret your purchase for even a moment. Literally nothing to complain about here. Definitely a great buy for the money. Android is all the rage these days, it seems, and if you are looking to make sure that you will be able to get the most out of your touch screen stereo, it may be the way that you want to go. Why are Android touch screen stereos becoming popular, though? Because Android OS’s, especially ones like Lollipop, are so very capable of utilizing so many apps and working with them, that it basically begins to rival Linux when it comes to how much you can customize it and what it can do. 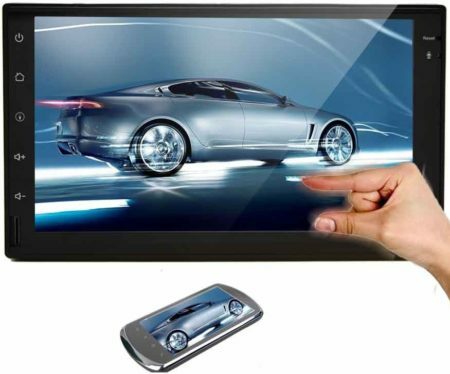 Without any work, your EinCar touch screen is capable of running files that are in the WMA, AAC, FLAC, and MP3 formats. That doesn’t sound like much, but that is the vast majority of sound files that are in common use these days. And with a little bit of effort, you can make it so that you will be able to watch films in almost any format that you could think of, which is great because there is only a handful that are currently in mass use. 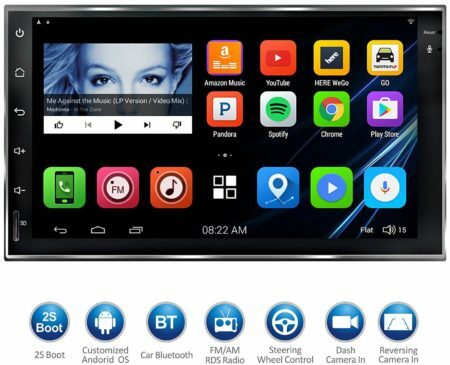 So, if you’re looking for an interesting Android OS touchscreen car stereo, look no further. You’ll be glad you picked this piece of equipment for your own. Jensen is a company that tends to offer decent products in an affordable range, but often without the bells and whistles that you get to enjoy from someone like Pioneer. Of course, the price point is more affordable, so there is always that to look forward to. The 6.2-inch screen on the Jensen VX7022 is notably better looking than a lot of the competition, which is weird when you realize that the quality and resolution of the screen is one of the easiest places for them to cut cost. It comes with a DVD player, of course, but that isn’t much different from the vast majority of the offerings here. Where it really begins to make its own name is when you look at the fact that it is capable of working with a wide variety of file types, right out of the box. It can utilize the MP1, MP2, MP3, and MP4 file types, as well as the AVI, WAV, ACC, and WMA types. If you look at that list, we’ve pretty much covered all of the file types that you are likely to encounter, so there isn’t much in there that you are not going to be able to watch or listen to. 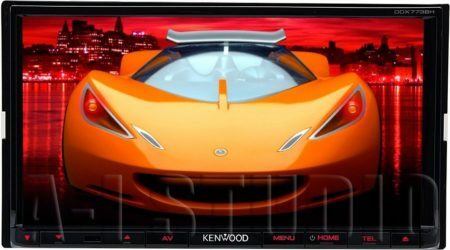 If you’re looking for a decent and affordable touch screen car stereo, here’s a good choice for you. Trust me, I’m well aware that when you think of ‘Kenwood’ as a brand, you don’t tend to think of something advanced. Shockingly, with this offering, they managed to put together a pretty advanced little stereo, and one that seems to be based on Android OS, which is even better. So, what does this offer that no other Kenwood model thus far has had to offer? Well, a few things. If you look closely at that screen, you may notice that there’s a Pandora and a Spotify icon on it. That means that, yes, it is capable of operating both of those programs, and allowing you to cycle through music based on your preferences and the algorithms that determine how they will continue to transfer you through their music library. Of course, it just wouldn’t be a car stereo without a DVD player these days, and the Kenwood DDXT24BT has one that you will be able to enjoy. There’s also a lovely Bluetooth connection that you can use not only to stream your audio, but to get the most out of your phone and the hands-free call function. Not too shabby for something offered by Kenwood, that’s for sure. 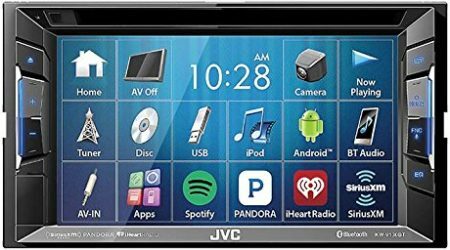 JVC has not put up the best offerings in the search for a decent car stereo, but this one is far and away a much better device. To begin with, it is compatible with a wide variety of applications, such as Pandora, Spotify, and iHeartRadio, as well as SiriusXM. Between these four applications, if you manage to run out of things to listen to that you can enjoy, you have very serious problems that not technology will be able to fix, honestly. Then, of course, there’s the fact that it has a rearview camera. This is something that more and more vehicles are including these days, in order to make sure that people who never properly figured out how to judge distance do not rear end a lot of vehicles (or people), and it’s a nice touch to have no matter what. It also comes with the ability to, via a USB cable or a Bluetooth connection, stream directly from either an iPod/iPad/iPhone or an Android mobile device, which is another great thing. Finally, it even has hands-free calling, run over the Bluetooth connection, so you can answer your phone without breaking the law in most places. All things considered, if you’re okay with buying a stereo from a business that is not well known these days, you will be rewarded for investing your money in this JVC product. If you’re just looking for something that offers you the bells and whistles you desire, and you’re not worried about things like buying a big name brand or anything like that, then the Pyle is for you! And not just that, but it also comes with a handy remote, which is kind of cool, right? What kind of bells and whistles does it come with? Well, it comes with hands-free calling, of course. It also comes with a rearview camera that you can use to make sure that you’re not running over small children or pets or anything like that (that is, if you don’t understand how to drive a car or that people may be behind you and you need to check your rearview mirror). It also comes with a DVD player, which is always nice, as well as a GPS, an SD Card reader, and even a USB connection. 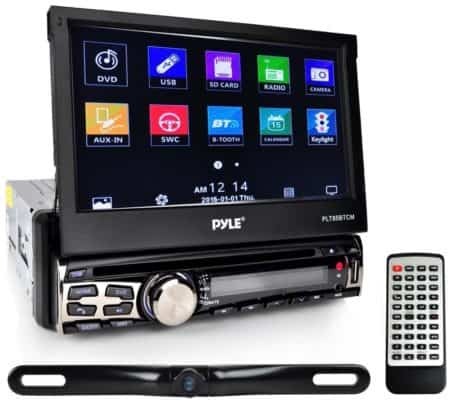 All things considered, if you are looking for a low price option that will still do a lot of the things that the higher priced options are capable of doing, and you’re not afraid of having a name that isn’t all that well known, this Pyle Plt85Btcm car stereo may be the best thing for you. So, you’ve come to the point where you are definitely interested in buying a touch screen car stereo, either because you spend enough time driving that it becomes worthwhile, or because you have kids that you really want to entertain, or maybe you just really want an onboard GPS. Whatever the reason, it is likely that you have a few questions, and here are just a few of the answer to questions you may have. Pretty much every DVD player every made is able to run CDs. Similarly, but on a slightly unrelated note, just about every single Blu-Ray player out there can run CDs and DVDs, as well as the Blu-Rays that they are designed to work with. Can I Watch DVD’s While Moving? Yes, you can. On most of these, video functionality is tied to a wire that is tied to your brakes being on or your car being in park, depending on the particular stereo in question. But if you were to ground that wire, instead of running it appropriately, then you would be able to watch videos, even when you are driving. Now, that does not mean that this is something you SHOULD do. Watching film or video while driving is illegal in most places, and even if it isn’t illegal, it represents an immense risk, and you can end up permanently maimed or much worse. I would definitely not recommend that you ever watch video while you should be driving a car, just like you shouldn’t be texting while driving or playing around with your phone and its applications while you are driving. Drive safe, and arrive at your destination safely. What Are The File Types I’m Likely To Encounter? Last I checked, a lot of the music that you are likely to encounter, whether you bought it or downloaded it or pirated it, is going to be in a handful of file types. We’re mostly talking about things like MP3 or WMA, with the occasional WAV file thrown in for good measure. But if you’re talking about video, you are going to find that a lot of the common file types you will encounter in the video world are MP4, AVI, WMV, and DivX. If you can run these file types, you will likely never find a video that you are not going to be able to watch. If all else fails, you can always stream the video via a device; when you do that, the device you’re streaming from is the one that has to be able to decrypt the video, not your car stereo. We’ve had a lot of fun here today, and we’ve taken a look at ten of the best touch screen car stereos that are on the market right now, but the time has come to drop the pretense that they are all equal and to find one that we can rightly and justly declare ‘the best touch screen car stereo’. This is not only the best overall product, but it comes with a name and a pedigree that can be trusted, as well as decent customer service and a good warranty that you can trust. It is the most advanced of the reviewed stereos, and dollar for dollar, it offers the most bang for your buck, so to speak. 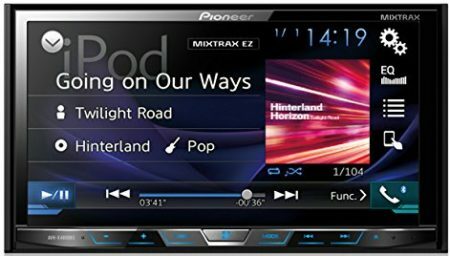 You will also find that, if you are looking for the best interface, the Pioneer AVH-X4800BS is definitely the stereo that offers it. No matter which of the reviewed products you decide to spend your money on, though, you are definitely going to find that you get a decent product, and one that will provide you with entertainment and loud noises to keep you awake for years and years of driving. Just be sure that you obey all applicable laws when you’re utilizing your stereo.